SGX Day Traders: 2nd Groups of SGX Day Traders Live Trading webinar trial invitations are deliver to your mail box. 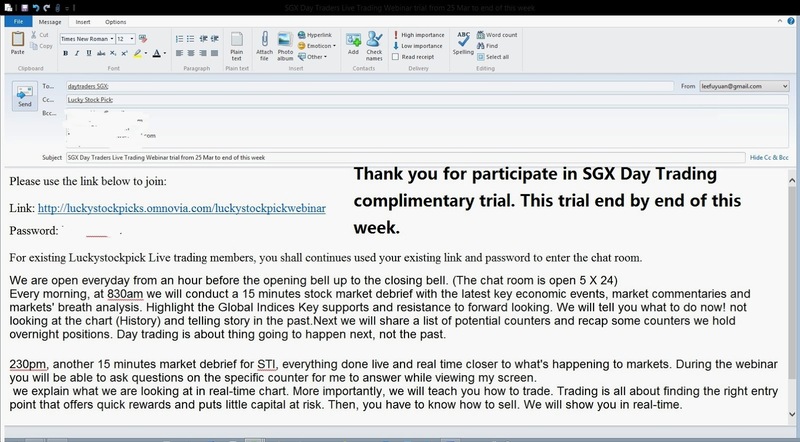 2nd Groups of SGX Day Traders Live Trading webinar trial invitations are deliver to your mail box. Thank you for the interested in participate the trial. If you have requested the trial and never received our Email invitation, please notify us again. You may also want to check your JUNK mail box first. Good information regarding SGX Exchange , discussing about the healthy participation of groups of sgx day traders in the market. 2014 Mar 27 Yoma --SGX day Trade Success. 24 Mar 14 SGX Success Day Trade!